Home » Celebrities » George Clooney and Amal: Is the Marriage Over?!? George Clooney and Amal: Is the Marriage Over?!? According to a bombshell new tabloid report, Brad Pitt may have a new wingman the next time he goes to pick up ladies at a bar. Because while George Clooney may appear to have a happy and healthy marriage on the outside, the latest issue of In Touch Weekly alleges that the actor may soon join his close pal Pitt in bachelorhood. Indeed, for just about the first time since he married wife Amal four years ago, there are now rumors that the relationship is in trouble. Major trouble, says an anonymous source. “They’ve been living apart and sleeping in separate bedrooms for months, and it’s putting a lot of stress on the marriage,” claims this insider, who the magazine swears really does exist and really does know stuff about the famous twosome. The stars welcomed twins into the world in June of 2017 and not much has been written about their romance since. … or it could mean the marriage really is faltering and the couple can’t even put a fake smile on in public together. This same article says that Clooney looked “tired” at his October 26 Casamigos Halloween party in Beverly Hills, which isn’t necessarily a sign that he’s on the verge of a divorce. However, going strictly by these In Touch quotes, it does sound like the 57-year-old star’s union could be to blame. George and Amal exchanged vows married on September 27, 2014, at the Aman Canal Grande hotel in Venice, Italy. For years and years, of course, Clooney was considered unattainable by most of the free world. He has been married previously and spoke in bitter tones about the experience and clearly had a grand time playing the female field as a leading man in Hollywood. But the heart wants what the heart wants and you can’t fight true love. Clooney realized why both of these sayings hold true upon meeting Amal. Unfortunately, it now appears as if the significant step the couple had after getting married – becoming parents of twins Ella and Alexander – is creating a troublesome obstacle between the parents. 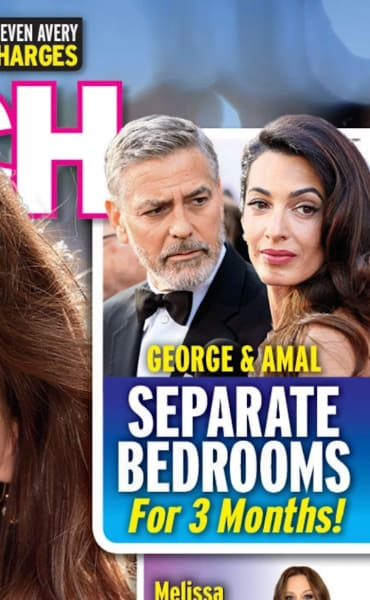 The magazine says that George wants to move back to Los Angeles full time with his wife and 17-month old kids, but Amal thinks they should reside in London. This sort of situation would be difficult to navigate for any first-time mother and father — but George and Amal are doing this for the first time with two babies! That’s twice as many babies as the average parents must deal with. “When George and Amal found out it was twins they were surprised, but also a little scared because they both had said that one was enough,” a different source had previously told In Touch. This doesn’t mean they don’t love both of their children, of course. He’s 57 years old and has two toddlers at home!